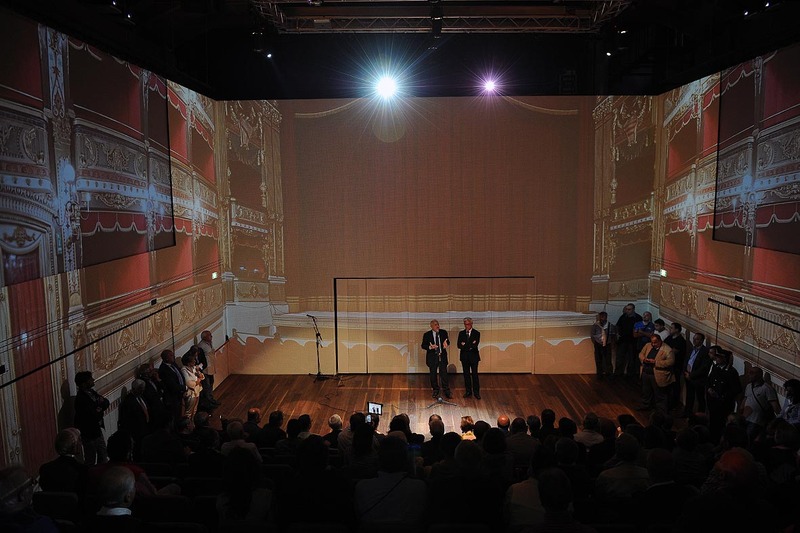 The total functional and architectural rearrangement of the structure built by the city of Salerno has allowed the construction of a new hall for multimedia events. Fourteen projectors, big screen and a grandstand with 180 fully retractable seats allow to re-use the “Diana” with extraordinary and immersive multisensory viewing experience. The ex Cinema Teatro Diana becomes a more important place of artistic production that enriches the cultural offer of the city. The central hall has been bordered with fixed panels, walls and maneuverable drapes; so this space can assume different conformations in relation to the activities to be hosted. The system of 14 projectors enables the projection of videos and images on all fixed and mobile walls; the grandstand with retractable tiers and recliners allows to have the entire surface of the room to accommodate 180 spectators; support ing equipment of the projectors allow to easily set up the theater activities, exhibitions and congresses; air conditioning and security systems installed ensure a remarkable comfort. Access to the hall is possible from the front facing the avenues of the recently reconfigured Waterfront. The entrance spaces will be used as bar-foyer; they have been paved with a resin decorated surface and are equipped with lighting systems and air-conditioning.